Note: the no-summary part needs to be added on R3 since that is where the summaries will be coming from. Totally not so stubby areas are areas where we expect a stub network, however we want to do some redistribution. That means an autonomous system border router (ASBR) resides in our stubby area. What we expect to happen in a totally not-so-stubby-area is that we WILL NOT be getting all the summary LSAs, just a default route. However we will also redistribute networks with type 7 LSAs into OSPF. These type 7 LSAs DO cross area border routers. 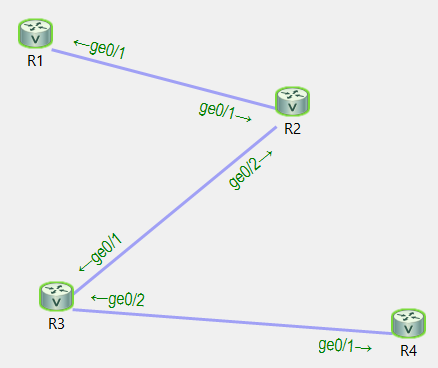 That means in Area 1 and 0 we expect to see a type 7 LSA for the redistributed network into OSPF. 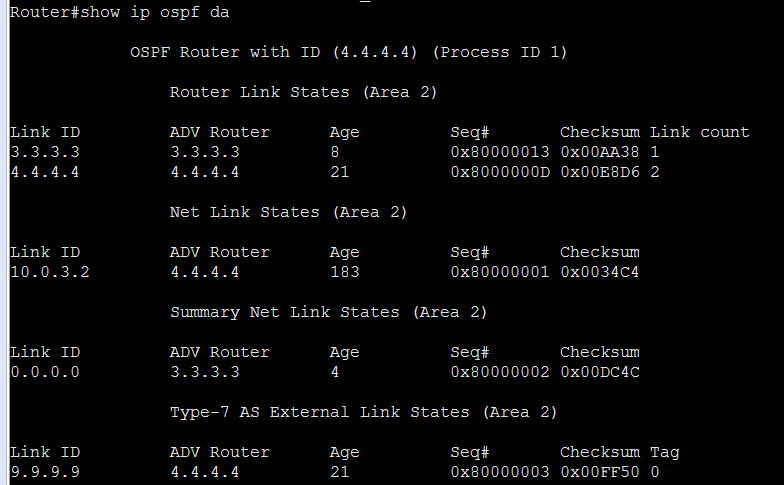 We also expect to see summary LSAs for the networks that live in area 2 (R3 to R4 and their loopbacks). To reiterate, in area 2 (R3 to R4) we expect to see a type 3 summary LSA that is a default route out to our ABR, R3. We also expect to see the type 1 LSAs describing the routers in this area, along with the Type 2 LSAs describing the networks/links. We also expect to see the type 7 LSA that was generated from the ASBR in our area, R4 for the redistributed network. 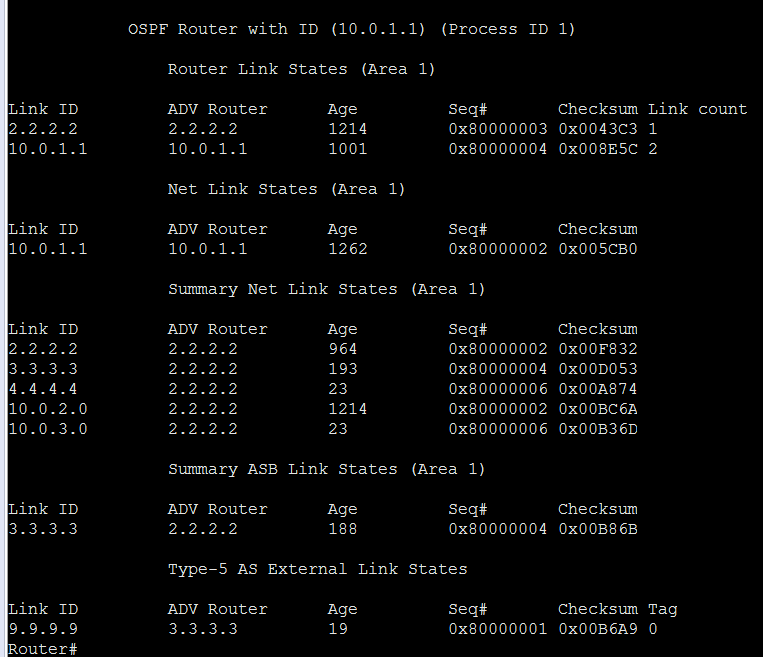 Let’s check out what our OSPF DB looks like from Area 2, R4. Notice we saw exactly what we expected from area 2, a default route as a type 3 lsa, a type 7 lsa describing the network that was redistributed, and the type 1,2 LSAs in the area. Let’s check out area 1 to confirm our thoughts. Notice here we have all the type 1 (router) LSAs for area 1, the network LSAs, then summary LSAs from other areas. We see that the type 7 LSA was translated to a type 5 LSA after it passed the ABR. This is because type 7 LSAs can’t cross ABRs, they need to be translated. We also see that to get to the type 5 networks we have a type 4 LSA. This LSA tells us how to get to the ASBR.